CHIP was passed into law in 1997 under President Bill Clinton with bipartisan support– in the Senate, the bill creating the program was cosponsored by Ted Kennedy, a Democrat, and Orrin Hatch, a Republican. CHIP is structured sort of like Medicaid: the federal government provides most of the funding, but it’s administered at the state level, and states can set their own eligibility levels. The original legislation provided states with federal funds to cover children in families whose incomes were up to 200% of the poverty line; the CHIP Reauthorization Act signed by President Obama in 2009 raised that cutoff to 300% of the poverty line. One major difference between Medicaid and CHIP though is that Medicaid is an entitlement program, meaning that states get federal funding on an as-needed basis– the federal government covers a certain percentage of the cost, no matter how many people sign up or how much their care costs. CHIP, on the other hand, is a block grant program, meaning that states get a fixed amount of money for CHIP each year– if a state runs out, then it’s on the hook for the extra cost. In practice though, CHIP has always received enough funding that states don’t run out (that’s in contrast to the GOP’s recent proposals to convert Medicaid into a block grant program, which are typically just a sneaky way to gut Medicaid funding). The other big difference is that Medicaid doesn’t expire, and its funding is mandatory— in other words, Congress doesn’t have to keep voting every year to appropriate money for it, since its spending level is set by the law itself. CHIP, however, was established in 1997 as a ten-year program, which means that every so often Congress has to vote to extend it. The latest reauthorization was set to expire on September 30, 2017. CHIP was originally funded by a tax on tobacco products, but that funding wasn’t locked in. When the Congressional Budget Office does its budget scoring it looks at current law and doesn’t assume that Congress will reauthorize temporary programs– even ones as popular as CHIP– so whenever CHIP has been set to expire, it assumes the money from those tobacco taxes will go to the general fund. This means that every time Congress extends CHIP it has to find new money to offset the cost, or else it will be counted as increasing the deficit. So… what took Congress so long? One of the biggest problems in getting a CHIP reauthorization passed was finding $8 billion a year in offsets that both parties could agree on. In October (which by the way was after CHIP funding had expired– more on that in a sec), the House Energy and Commerce Committee passed a bill that would have funded CHIP through 2022, and paid for it by making a couple minor changes to Medicaid and increasing the premiums that the wealthiest Americans (those making more than $500,000) pay for Medicare. These offsets were nearly identical to those in a bipartisan bill passed by the Senate Finance Committee. However, this bipartisan compromise was rejected on the floor of the House. House Republicans instead used the bill as an opportunity to troll Democrats, since what they did pass was obviously going nowhere in the Senate. The bill would have offset the cost of CHIP by (1) ending the grace period for people who are late paying their ACA insurance premiums, causing an estimated 500,000 people to lose coverage; (2) denying coverage to kids while billing issues were being resolved; and (3) eliminating the ACA’s Prevention and Public Health Fund. Just last month, when Congress passed a bill to repeal the Independent Payment Advisory Board, a panel created through the ACA to make cost-saving recommendations, legislators waived the $18 billion offset requirement. And now Congress is preparing to pass a mammoth tax reform bill that the Joint Committee on Taxation said Wednesday would fall almost $1 trillion short of paying for itself. Offsets be damned. Watching Republican senators like Orrin Hatch say that, “The reason CHIP’s having trouble is because we don’t have money anymore,” while at the same time pushing for a tax cut that mainly benefited corporations and the wealthy which would add a trillion dollars to the deficit was especially infuriating. However, one weird silver lining of the GOP’s tax plan is that after it passed, Congress could pass CHIP basically for free. That’s because the tax bill also repealed the ACA’s individual mandate, which will drive up premiums for plans on the exchanges and the cost of subsidies to help pay for those premiums. According to the Congressional Budget Office on January 5, covering kids through CHIP would cost the government less money than paying for subsidies for private coverage on the exchanges– reauthorizing CHIP until 2022 would cost less than a billion dollars over the five years; reauthorizing it until 2027 would save the government $6 billion. Despite the fact that reauthorizing CHIP would now save the government money, the Republican-controlled Congress still didn’t act. Instead, they passed a three week extension of CHIP, and then tried to use the program as leverage in a fight over the federal budget, despite the fact that at least six states — Arizona, California, the District of Columbia, Minnesota, Ohio, and Oregon — were expecting to run out of CHIP money sometime in early February. It turns out that CHIP wasn’t the only thing Congress had neglected to fund– they also hadn’t passed a budget, which meant they needed to pass a continuing resolution (CR) by 11:59 pm on Friday January 19th to keep the federal government open. Republicans didn’t have enough votes in the Senate to pass a CR on their own, and Democrats had two demands: CHIP funding and DACA (legislation to protect young undocumented immigrants whose parents brought them to the U.S. when they were children). The American public supports both programs by huge margins, and both programs have bipartisan support in Congress– they would pass easily if they came up for a vote. Republicans agreed to a six-year extension of CHIP, but refused to take action on DACA. Presumably this would allow the GOP to run ads saying that Democrats shut the government down because they’d rather protect illegal immigrants than fund children’s healthcare. However, neither side likes a shutdown, and it only lasted until Monday, when Republicans agreed to attach the six year CHIP extension to a three-week CR, and promised to hold a vote on DACA before the CR expired. 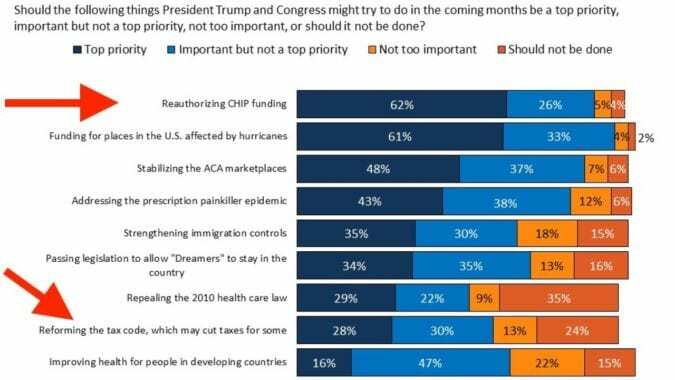 So to recap… Polls showed the American public saying that extending CHIP funding should be Congress’s top priority. When they finally got around to it– after the funding had expired– Republicans killed a bipartisan bill to fund it, and moved onto a tax plan that added a trillion dollars to the deficit while insisting that they couldn’t find the money to fund CHIP. Then after finding out that they could pass an extension of CHIP basically for free, the GOP instead used it as leverage in budget negotiations in an attempt to get Democrats to choose between children’s healthcare and protecting the Dreamers, both of which are wildly popular. Oh and they only agreed to a six-year extension, when a permanent extension would have reduced the deficit. In the end, it’s tempting to say that all’s well that ends well, since Congress eventually did the right thing (on CHIP anyways– the fate of the Dreamers is still unclear) and no state ran out of CHIP funding before the program was reauthorized. 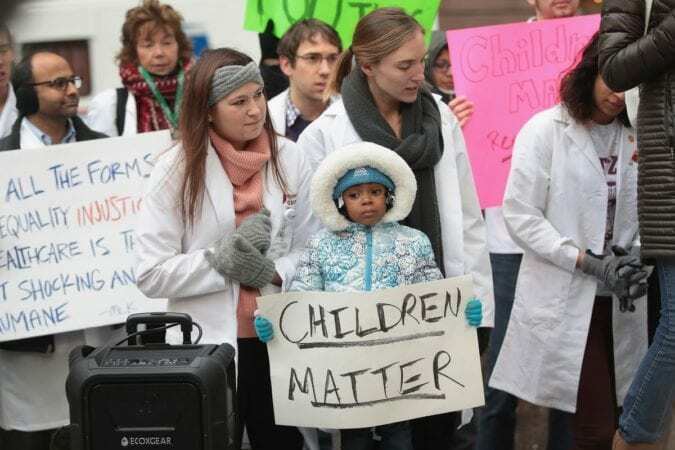 However, Joan Alker, executive director of the Georgetown University Center for Children and Families, told NPR “[she] worries that the months of uncertainty around CHIP may have already caused children to drop out of the program, increasing the uninsured rate among children.” Hopefully the current leadership in Congress saw that. We know that playing stupid political games is kind of their bread and butter, but it shouldn’t be too much to ask that they knock it off when kids’ lives are at stake.